This example illustrates the manipulation of positive and negative space, as depending on how your eye determines what the positive space actually is, two different images can appear. 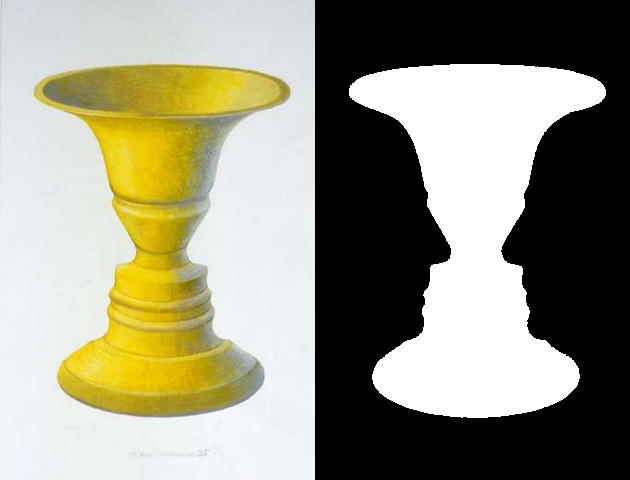 If the central shape is interpreted as positive space, it appears to be a vase, but if that same shape is viewed as negative space, the profiles of two faces become apparent. Some artists focus primarily on the subject when determining their overall composition for a painting, but many enjoy playing with negative space and using it to balance the work. Laura’s thoughtful and liberal use of negative space as part of her compositions plays a big role in the way these works possess a sense of stillness and peace, as if a moment has been captured. Imagine for a moment if Laura had continued to fill the positive space of these works with more background imagery, more colors and textures and objects. It’d really change the impact of the paintings, don’t you think? You can check out all of Laura’s gorgeous, peaceful work at Principle Gallery on our website here. For more incredible artwork from Principle Gallery, be sure to subscribe to our blog and follow our social media pages on Facebook, Twitter, Instagram, Pinterest, and YouTube!